The Jets signed slot receiver Jamison Crowder to join Enunwa and Robby Anderson in their wideout corps, ESPN.com's Rich Cimini and John Keim report. New coach Adam Gase wants to expand Enunwa's route tree, Rich Cimini of ESPN.com reports. "I don't want to put him in a box," Gase said. "I want him to be able to try to do as many things as he possibly can." Enunwa (ankle) was placed on injured reserve Saturday. Analysis: Enunwa was already ruled out for Sunday's season finale against the Patriots, so the Jets are simply making the move to clear some roster space for healthy bodies. The 26-year-old inked a four-year, $36 million contract with the Jets on Friday, and had 38 receptions for 449 yards and one touchdown in 11 games this season. The Jets and Enunwa (ankle) reached an agreement Friday on a contract extension, Eric Allen of the team's official site reports. Enunwa (ankle) won't play Sunday against the Patriots. Analysis: Jermaine Kearse (Achilles) has also been ruled out, which sets the stage for Robby Anderson to head the Jets' wideout corps Sunday, with added reps on tap for Andre Roberts, Deontay Burnett and Charone Peake. The 26-year-old Enunwa, who is eligible to become a free agent this offseason, finishes up the 2018 campaign with 38 catches (on 68 targets) for 449 yards and a TD in 11 games. Enunwa (ankle) wasn't seen at the early portion of Friday's practice, Ethan B. Greenberg of the Jets' official site reports. Analysis: Enunwa was given a "slim" chance of playing Week 17 on Monday and didn't participate at practice the last two days. The 26-year-old appears to be headed for his third straight absence, which could be confirmed when the Jets release their official injury report later Friday. Enunwa (ankle) didn't participate in Thursday's practice, Manish Mehta of the New York Daily News reports. Analysis: With back-to-back absences from practice to kick off Week 17, Enunwa hasn't done anything to improve his outlook from Monday, when coach Todd Bowles admitted the wideout had a "slim" chance of playing in the season finale Sunday against the Patriots. With Jermaine Kearse (Achilles) also in danger of missing that contest, added reps could be on tap for Andre Roberts, Charone Peake and Deontay Burnett alongside top target Robby Anderson. Enunwa (ankle) wasn't spotted at practice Wednesday, Ethan B. Greenberg of the Jets' official site reports. Analysis: Coach Todd Bowles indicated earlier in the week that there was only a "slim" chance Enunwa would be available Sunday against the Patriots, so the wideout's absence from practice doesn't come as a surprise. Bowles' bleak assessment of the situation should be enough to keep Enunwa off the fantasy radar in Week 17. 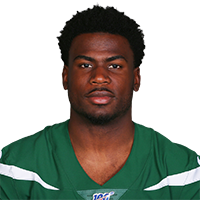 Coach Todd Bowles said Monday that Enunwa (ankle) has a "slim" chance of playing in the Jets' season finale against the Patriots next weekend, Brian Costello of the New York Post reports. Enunwa (ankle) has been ruled out for Sunday's game against the Packers. Analysis: With Enunwa out again this weekend, Robby Anderson, Jermaine Kearse and Andre Roberts are in line to continue to head the Jets' wideout corps in Week 16. Enunwa (ankle) wasn't in attendance for Thursday's practice, Ethan B. Greenberg of the Jets' official site reports. Analysis: With Enunwa following up a Week 15 absence with non-participation in practices Wednesday and Thursday, his chances of returning to action Sunday against the Packers don't appear promising. The Jets will see if Enunwa is able to do anything at Friday's practice before ruling on his status for the contest, but he looks on track to carry a questionable designation into the weekend in a best-case scenario. Enunwa (ankle) didn't practice Wednesday. Analysis: Per Connor Hughes of The Athletic, Enunwa is still recovering from an ankle sprain, which prevented him from playing in the Week 15 loss to the Texans. His inability to practice Wednesday isn't a promising sign, though he does have two more chances to return to work in advance of Sunday's game against the Packers. If Enunwa remains sidelined this weekend, Robby Anderson, Jermaine Kearse and Andre Roberts would continue to head the Jets' wideout corps. Enunwa (ankle) has been ruled out for Saturday's game against the Texans, Eric Allen of the Jets' official site reports. 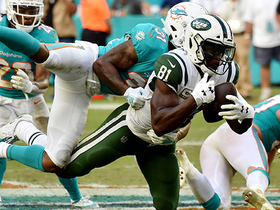 Analysis: With Enunwa out this week, Robby Anderson and Jermaine Kearse are in line to head the Jets' Week 15 wideout corps, while Rishard Matthews could also see his workload increase Saturday. Enunwa (ankle) wasn't on the field for Wednesday's practice, Ethan B. Greenberg of the Jets' official site reports. Enunwa (ankle) was not on the field for Tuesday's practice, Rich Cimini of ESPN.com reports. Analysis: Enunwa aggravated his previous ankle injury in the second quarter of Sunday's game against the Bills, so we're not surprised by the fact that he's sitting out the practice session just a pair of days later. With the Jets slated for an early game Saturday against the Texans in Week 15, Enunwa will have one fewer day than normal to recover from the injury. Enuwna was removed late in the second quarter of Sunday's game against the Bills with an ankle injury and is questionable to return, Brian Costello of the New York Post reports. Analysis: The wideout more than likely aggravated the high-ankle sprain that prevented him from playing in Weeks 7 and 8 and has made him a fixture on the Jets' injury reports ever since. It's unclear at this time how significant Enunwa's setback might be, but the Jets should offer an update on his condition coming out of halftime. Enunwa (ankle) was a limited practice participant Wednesday, Rich Cimini of ESPN.com reports. Analysis: Enunwa was also limited last Wednesday before upgrading to full participation Thursday and Friday. He doesn't seem to be in much danger of missing Sunday's game in Buffalo but will have to contend with a pass defense ranked second in yards allowed per attempt (6.4) this season. The Jets are hoping to get Sam Darnold (foot) back under center this week after a three-game absence. Enunwa caught two of six targets for nine yards in Sunday's 26-22 loss to Tennessee. Analysis: Enunwa fell just one shy of the team lead in targets on the day, but as with most of the team's receivers, he just couldn't connect with Josh McCown. It came as quite a disappointment after the 26-year-old produced his second-best game of the season just a week ago. Fortunately for the former Cornhusker and the Jets offense in general, Sam Darnold (foot) should be back under center at Buffalo in Week 14, although the Bills represent the league's toughest matchup for receivers so far this season. Enunwa (ankle) put in a full practice Thursday, Andy Vasquez of The Bergen Record reports. Enunwa (ankle) was limited at practice Wednesday, Rich Cimini of ESPN.com reports. Analysis: Enunwa played 60 of the Jets' 64 offensive snaps in the team's Week 12 loss to the Patriots. It's likely that his restrictions Wednesday were for maintenance purposes, as there weren't any reports that he aggravated the lingering ankle issue against New England. After pacing the Jets with 73 receiving yards last week, Enunwa likely ranks as the top option in the passing game heading into Sunday's matchup with the Titans. Enunwa caught all four of his targets for 73 yards in Sunday's 27-13 loss to New England. 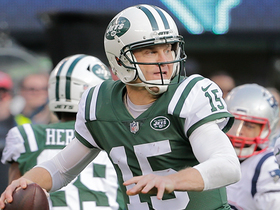 Analysis: Only four of Josh McCown's 45 passing attempts were intended for Enunwa, but the 26-year-old wideout still finished as the team leader in receiving yards. Bolstered by a 41-yard catch, Enunwa posted his second-highest yardage total of the season. He hasn't found the end zone since Week 1, though, so it's hard to get too excited about Enunwa ahead of a Week 13 clash with the Titans. Enunwa (ankle) doesn't have a designation for Sunday's contest versus the Patriots. Enunwa (ankle) was a limited participant in Wednesday's practice, Rich Cimini of ESPN.com reports. Enunwa (ankle) caught four of eight targets for 18 yards in Sunday's 41-10 loss to Buffalo. Analysis: Enunwa led the Jets in targets and catches, but he tied for third in receiving yards as the whole offense laid an egg under backup quarterback Josh McCown. The physical wide receiver showed good chemistry with rookie starter Sam Darnold before an ankle injury slowed Enunwa down, and Jets fans will be hoping the duo can get healthier and rediscover that form after the team's Week 11 bye. Enunwa (ankle) is slated to play Sunday against the Bills. Enunwa (ankle) was listed as a non-participant in Thursday's practice, Andy Vasquez of The Bergen Record reports. Enunwa (ankle) didn't practice Wednesday, Darryl Slater of NJ.com reports. 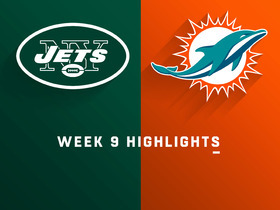 Enunwa (ankle) caught three of four targets for 40 yards during Sunday's 13-6 loss to the Dolphins. Analysis: Enunwa made his return after a three-game injury absence, finishing third on the team in catches and second in receiving yardage. He accomplished the feat on just four targets, as he seemingly has his workload limited in his first game back. Enunwa had a productive rapport with Sam Darnold earlier in the year and should return to the fantasy radar once he's back up to full speed. He'll look to build on this return next Sunday against the Bills. Enunwa (ankle) is listed as active for Sunday's game against the Dolphins. The Jets are optimistic Enunwa (ankle) will play Sunday against the Dolphins, Adam Schefter of ESPN reports. Enunwa is listed as questionable for the contest and considered a game-time decision. Enunwa (ankle) is listed as questionable for Sunday's game against the Dolphins. Analysis: The same applies to Robby Anderson (ankle), with Eric Allen of the Jets' official site relaying via coach Todd Bowles that both wideouts are viewed as game-time decisions ahead of the 1 p.m. EST kickoff. 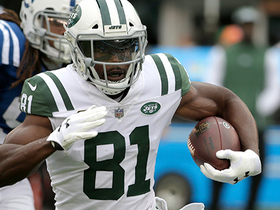 Enunwa, who last played Oct. 14, is bouncing back from a high-ankle sprain, so fantasy players will probably want to see him turn in a full and productive game before rolling with him in lineups. Enunwa (ankle) was spotted at Friday's practice, but worked on the side during the open portion of the session, Eric Allen of the Jets' official site reports. Analysis: Enunwa is right around the early end of the estimated 3-to-4-week timeline he was handed after first suffering the injury, but it's looking like he'll sit out practice Friday. That would mean that Enunwa didn't get in any work this week, making it unlikely he would be ready to suit up Sunday in Miami. Enunwa will almost certainly have to get some practice reps in before he's deemed ready for game action. Enunwa (ankle) was a non-participant in Thursday's practice, Darryl Slater of NJ.com reports. 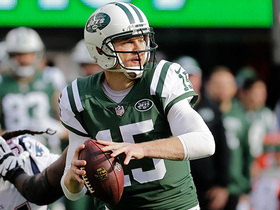 New York Jets quarterback Josh McCown throws a pass to wide receiver Quincy Enunwa for 41 yards. 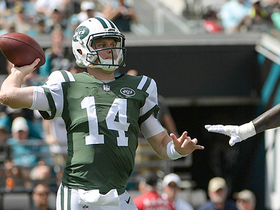 New York Jets quarterback Josh McCown throws sideline dime to wide receiver Quincy Enunwa for 17 yards. New York Jets wide receiver Qunicy Enunwa carries a pile of Miami Dolphins for HUGE gain. 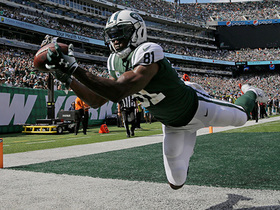 New York Jets wide receiver Quincy Enunwa makes picturesque diving grab. New York Jets quarterback Sam Darnold is intercepted by Miami Dolphins safety T.J. McDonald. Indianapolis Colts linebacker Darius Leonard forces the fumble and defensive end Al-Quadin Muhammad recovers it. 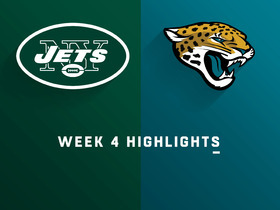 Check out some of the best plays from Week 4 New York Jets vs. Jacksonville Jaguars. 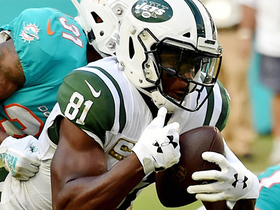 New York Jets wide receiver Quincy Enunwa catches for a 42-yard gain. 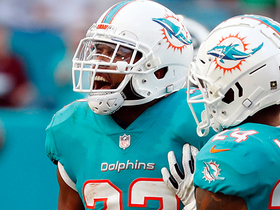 NFL Network's Cynthia Frelund gives her Thursday Night Football Week 3 fantasy projections for the New York Jets vs. Cleveland Browns game.